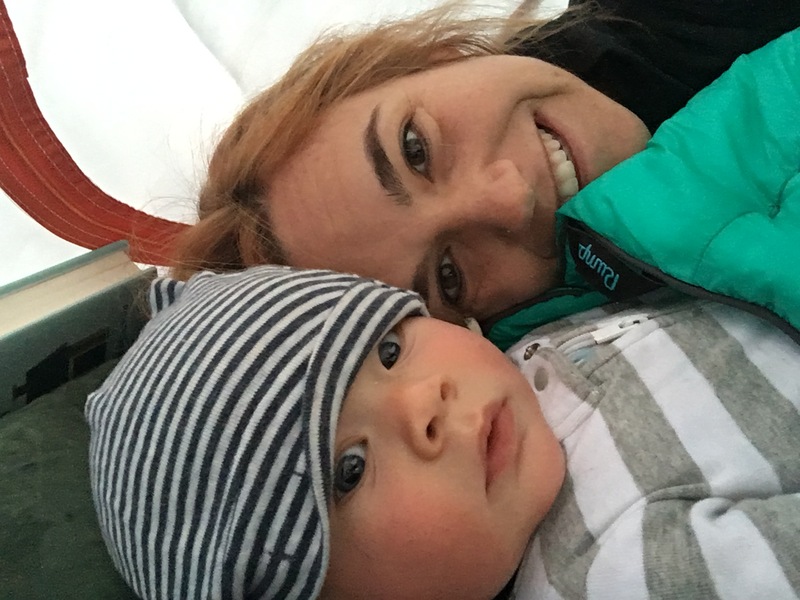 I said it before and I’ll say it again, outdoor adventures (or really, any adventures) with a baby can be super intimidating, but with the right mindset, preparation and gear, it can be a truly awesome experience for the whole family. 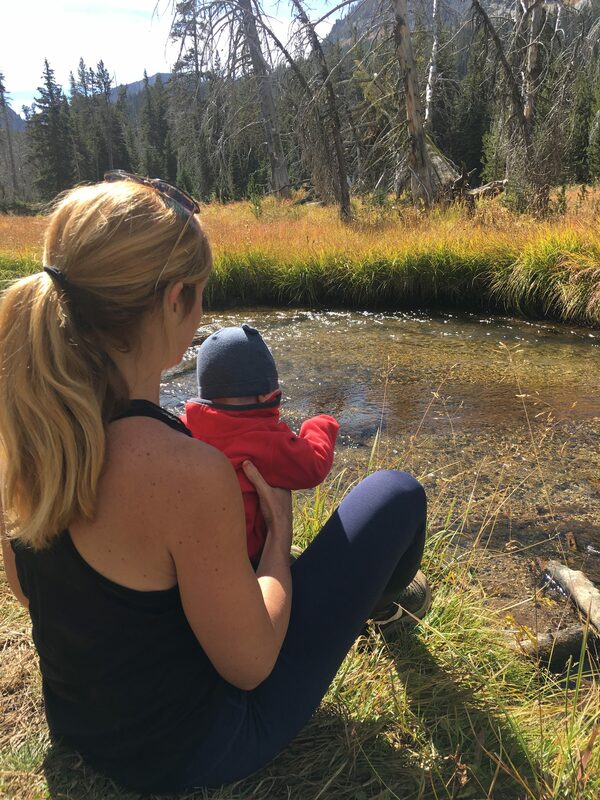 If you’re thinking about camping with your little one, and need some ideas for what to wear (for yourself and your baby), what to pack, and how to prepare, here are a few things we’ve learned from hiking, camping, and spending as much time outdoors as possible with our little man. Oh, the age old question of what to wear? While this obviously isn’t so much about style when you’re camping, it’s a pretty important question especially when it comes to camping with a baby. Since up to 20% of your heat is transferred from your head (and babies have a larger head than body), they lose heat even faster than you do in cold weather. It’s important to keep them warm from head to toe, and dress them in layers so you can remove clothes as the day heats up (you don’t want to overheat them either). Babies might not be able to directly tell you when they’re too hot or too cold, but they’ll let you know when they are uncomfortable – just make sure you’re listening. How to keep your baby warm at night. One of my biggest concerns going into the experience was how we were going to keep Colby warm enough at night. Since you shouldn’t cover little babies (those under one year) with loose blankets and bedding (hello suffocation hazard), we had to get creative with layering him in enough clothes so that he would be warm without making him too uncomfortable. Getting him ready for bed in the tent was a lot like getting dressed to go skiing. 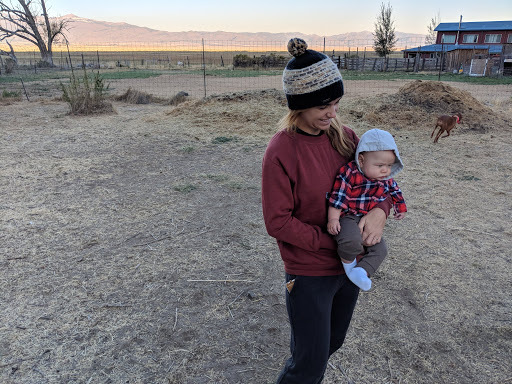 We started with a “base layer” – using his Kickee Pants jammies (size 3 months – aka snug spiderman suit on our 5 month old little man) since they are snug on the body and feel a lot like second skin and then layered on a pair of thick socks. From there, we put him in another pair of slightly larger Kickee Pants jammies (3-6 month size), and then on top of that, layered on some thicker footie jammies, this time from Gap (size 6-9 months, aka more roomie). From there, we put a beanie on his head and thick socks to cover his hands (we didn’t yet own any baby mittens), and a pair of large sweatpants over his legs. We tried to put a sweatshirt on him as well but he was not happy about it so we gave up on that part. While our efforts worked quite well to keep him warm for the first few hours of sleep, the wind chill was just got to too much for him to be on his own in the side sleeper we had borrowed for the trip and he ended up with me in my sleeping bag. How to keep yourself warm at night. 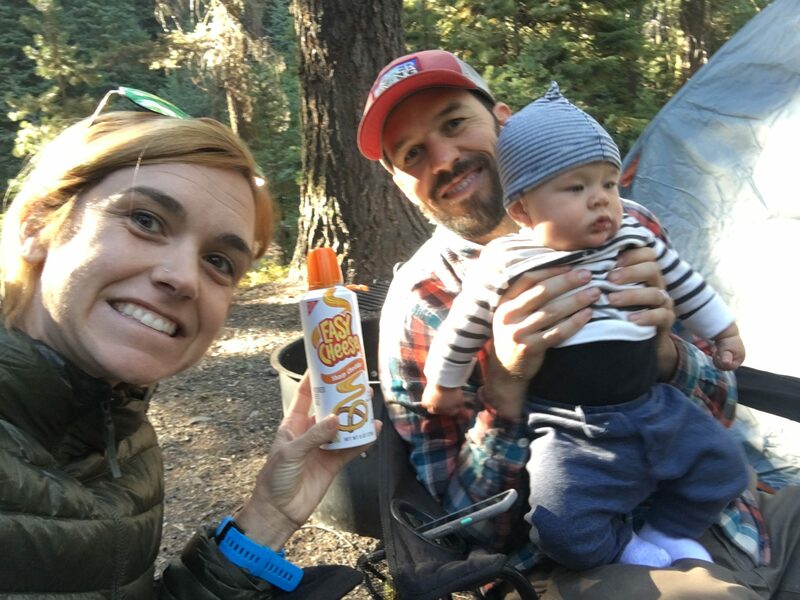 Part of camping successfully with a baby means you also need to take care of yourself – just as you want the baby to be plenty warm, you need to make sure you’re plenty warm so that you can be available and able to take care of your little one. You know, as they always say – put your oxygen mask on first. If you’re going to go camping with a baby, you need to be prepared to be in and out of your sleeping bag during the night – whether for diaper changes, soothing, baby temperature checks, and perhaps even for the event in which you need to give up some of your warmth (aka your sleeping bag) so that they can be warm enough (as I had to do). To stay warm at night and also be ready for action in the early morning hours, I suggest a good, versatile outfit that you can not only sleep in, but also feel comfortable wearing around the campsite in the cooler, early morning hours. For me, my success in sharing (aka giving up my sleeping bag) and being able to rock and roll all night and morning long comfortably was in large part due to my AMAZING new Cozy Up prAna sweatpants. 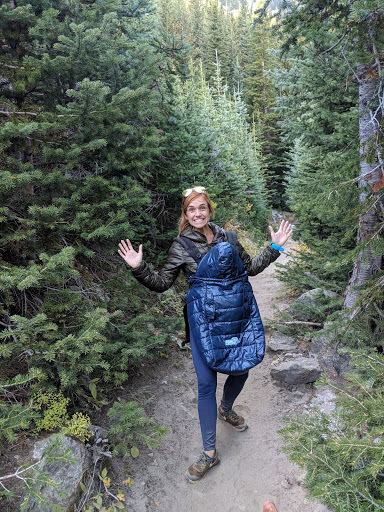 I practically lived in these sweatpants while we camped and adventured because they are not only the softest, most comfortable, and warmest sweatpants, they are also extremely versatile and flattering sweatpants (aka they don’t look like “sweatpants”). 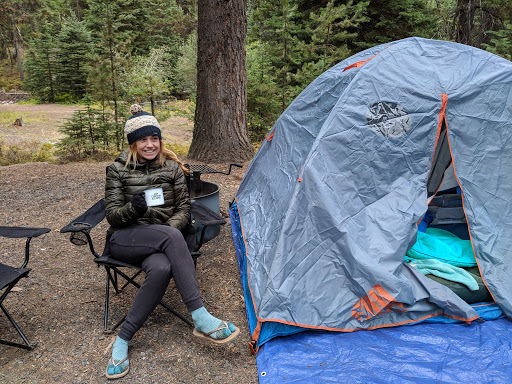 What’s great about these pants, aside from the fact that they kept me warm while sharing my sleeping bag and kept me looking cute around the campsite, is that they are sustainably made – meaning a small ecological footprint (pants I can feel good about wearing). The Cozy Up sweats are part of prAna’s new Cardiff Fleece hemp collection, made from sustainable and natural fibers – and are not only better for our earth but also moisture wicking, antimicrobial, and sturdy as hell. I paired them with my Cozy Up t-shirt (I have it in charcoal gray) and my oh so cozy Cozy Up sweatshirt (I am loving the mulled wine color, so cute with my charcoal gray pants!). And of course I had a jacket and beanie nearby at all times for quick, easy access. In terms of what you need to pack when you bring a baby camping, it’s not really that much extra. We borrowed a side sleeper (a portable bassinet) from a friend, and otherwise focused on our regular camping gear. Aside from that, we brought some things to keep him entertained and happy, clean and dry, and of course transportable. Honestly, it doesn’t take that much gear to keep our little guy entertained and happy; I could probably dance and make funny noises for hours and he’d be ok with it. But to stave off any potential boredom meltdowns, we brought some of his favorite books, his favorite toy (Dave, his Finn & Emma pirate rattle), and some teething toys. To keep him clean and dry, we made sure to plenty of diapers and wipes (I suggest overpacking these), a stash of Ziplock bags (for dirty diapers and wipes), hand and face wipes for quick and easy clean-up, baby lotion for dry, chapped skin situations, diaper cream, a couple burp cloths, and a couple of swaddles (for use nursing, to cover him, or even have him sit on). We also kept some baby Tylenol handy just in case. 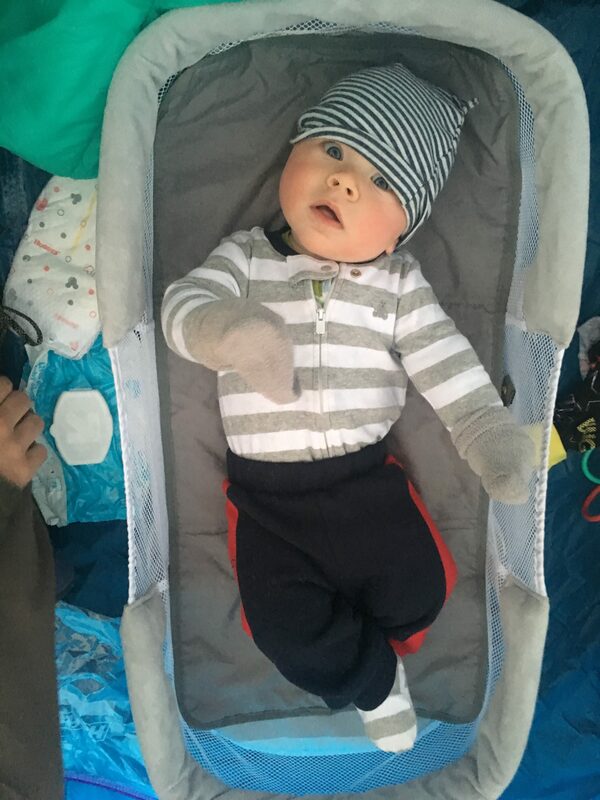 Our guy is only 5 months and still relatively light so we kept it simple and just brought the Ergo Baby for easy carrying on hikes, around the campsite, and for anytime we needed to carry him around for longer periods of time (like packing up the car or assembling / disassembling camp). We didn’t pack a stroller at all – for the whole 3 week journey – and honestly, it was fine for us. We also brought our Pookie Poncho to cover him while in the Ergo to combat wind and cold. 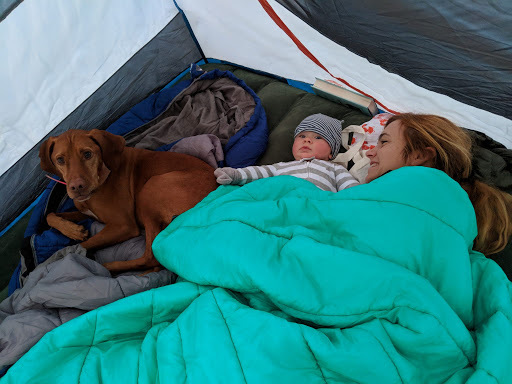 It’s always important to be prepared when you camp, but it’s even more important to be prepared when you’re sharing your tent with a little one. You’ll need to make sure you have the basics – tent, sleeping bag, tarp, lights, food, and plenty of water (especially important if you’re breastfeeding!). We took some extra precautions in our camp set up – we brought a tarp to lay on the ground underneath the tent to prevent some of the cold from getting in through the ground at night and set stuff aside to make room for the side sleeper and of of course brought the Rumpl blanket for extra warmth (especially important if you end up sharing your sleeping bag and also great for staying warm while nursing). We also set up tent lights so that we could more easily check on the baby at night and kept our headlamps within reach (you need good light for diaper changes and nursing). Since I’m still breastfeeding, feeding the baby while camping is pretty easy. You basically just need yourself and some spit up rags. Since we were on a long trip, I also had my Spectra portable pump and easy clean up wipes (to sanitize pump parts after pumping), as well as bottles handy. I just brought the bottle cooler straight into the tent since it was so cool at night, anyway. As always when caring for a baby, to be effective you also need to take care of yourself so make sure you have what you need to eat. 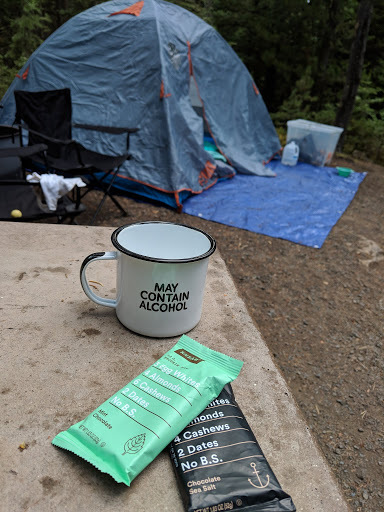 For us, that meant peanut butter & jelly sandwiches, RXBars (great for breakfast and snacks), Squeaky Pops for good and savory, healthy snacks, and even Mac N’ Cheese (we just used our JetBoil to make that). 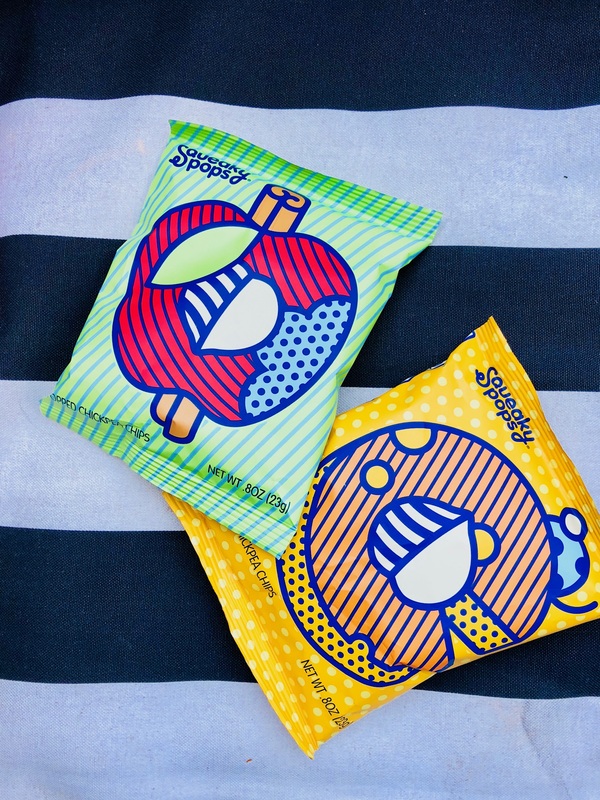 Want to try Squeaky Pops popped chickpea chips? Get 50% off your next order using the code 50FitApproach on SqueakyPops.com or Amazon. 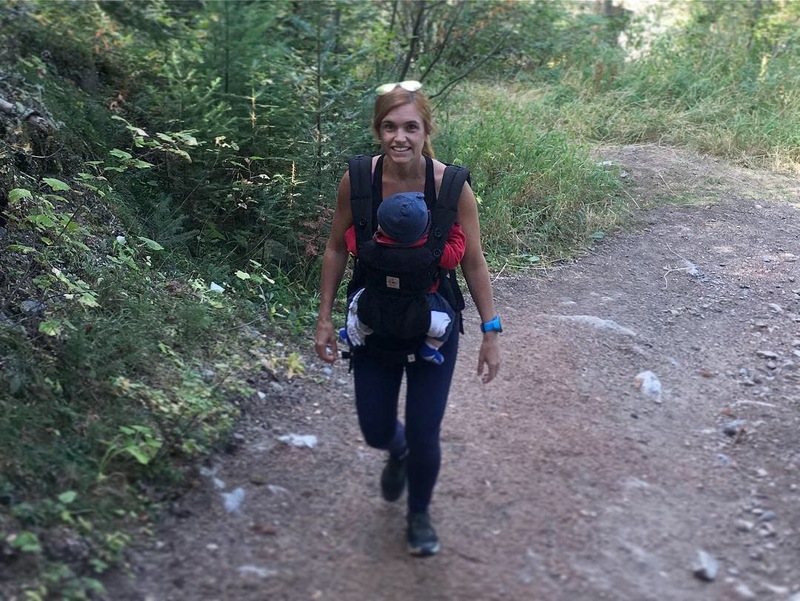 As dehydrating as hiking and camping can already be, once you layer on breastfeeding, you’re on a whole new level of hydration needs. 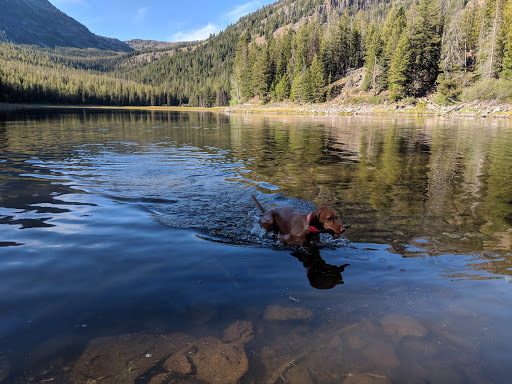 With two thirsty adults and a dog, we made sure we were plenty stocked up with gallons of water in the car and also brought our portable purifier for longer hikes. Little man doesn’t drink water yet but I needed to make sure I was plenty hydrated so I could properly feed and hydrate him. As you can probably tell, most of this is just common sense and a little trial and error. 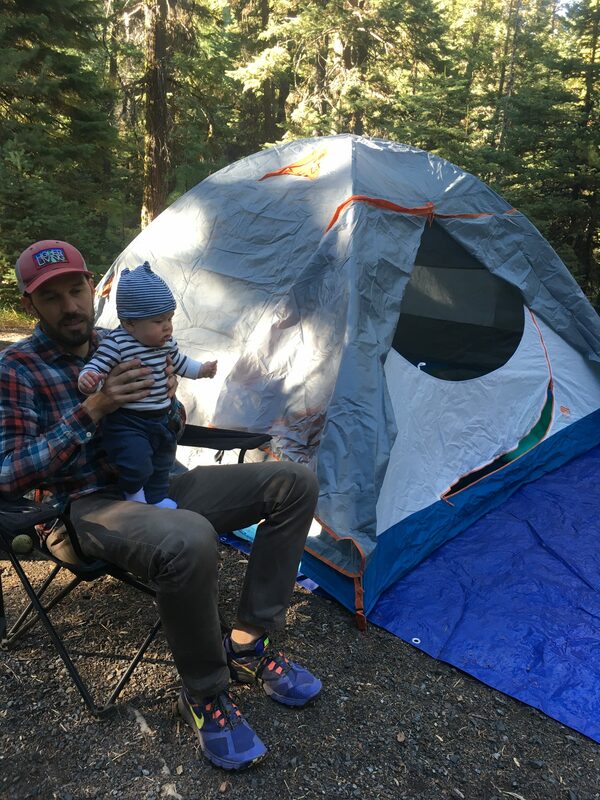 Camping with a baby doesn’t have to be overly complicated (and really, it shouldn’t be). Just make sure you have the basics covered, be prepared to be flexible with your plans, and most of all have fun (a good attitude and sense of humor goes a long way!). 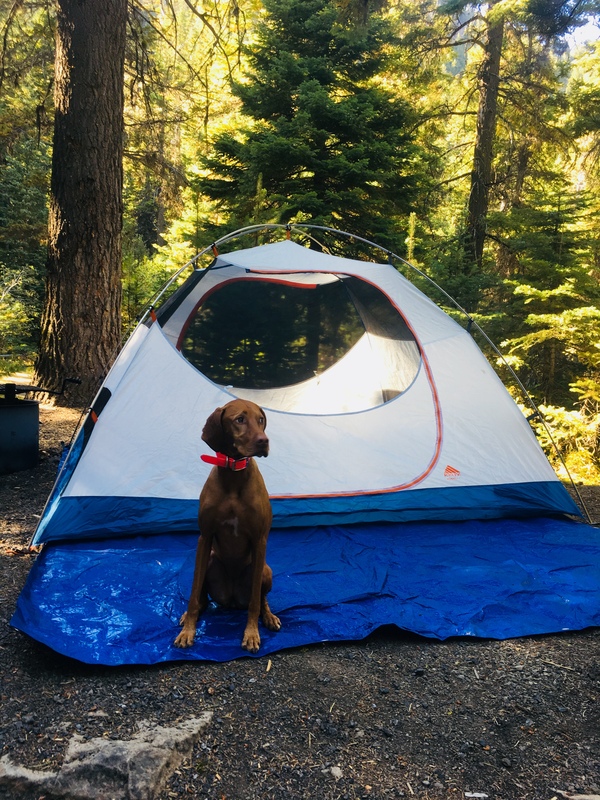 Tell me your best camping with baby tips, horror stories, funny memories, or stories! We’re hoping to do much, much more camping with our little man as soon as it gets warm enough to do so. Disclaimer: I was provided with prAna Cardiff Fleece Collection sweats and Squeaky Pops as a gift. That being said, all words, opinions, thoughts, and photos are my very own. I truly appreciate all of the brands that support the Fit Approach community. You crush the outdoor camping with a baby game!! Planning ahead is so key. I’m always very concerned about snacks. Do we have enough snacks? There’s no such thing as too many. And cozy clothes are a win. There’s nothing I enjoy more than sitting by a fire in cozy gear – I’m so glad I brought my prana sweats when we went on vacay last month! Prana sweats are the best for outdoor adventuring! And yes snacks..always.